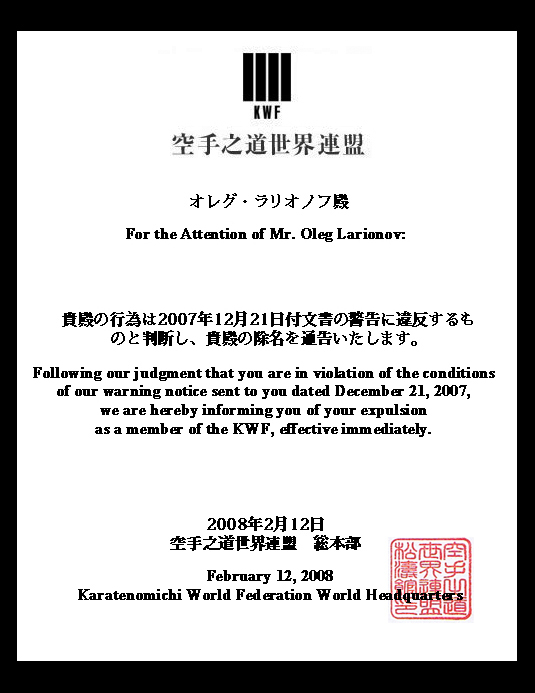 Dan License exams at KWF HQ. & Results of Championships on 25 September, 2016 Scotland. Dan and License exams at KWF HQ. We would like to inform you about the result of exam. Please see the list of people who passed Dan exam and License exam. 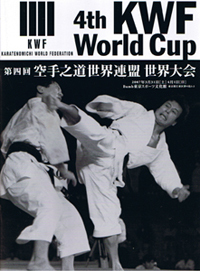 The KWF 2-day Seminar were held on April 25th, 26th, and The KWF Europe Cup on 27th in Torino, Italy . The Seminar theme focued on KWF techniques and approach to traditional Shotokan Budo Karate. On March 1st, KWF HQ held a final exam for instructor status for Motoyoshi Takahashi for Instructor status. Upon examination, Takahashi sensei was judged to have passed and is hereby now certified as a Shidoin (Instructor) of the KWF. as a member of the KWF, effective immediately. In April 2008, April 25th to 27th for thee days, the KWF Europe Cup and Europe Seminar organized by KWF Headquarters and ITALY UISP will be held in Torino, Italy. We'd like invite karateka from all over the world to participate in this outstanding opportunity to study and develop KWF Budo Karate together. September 7 (Fri), 8 (Sat), 9 (Sun), 10 (Mon): Assistant Chief Instructor Sensei Isaka Camp and KWF Grading in Manchester, UK. On April 1st, on the first day of the 4th KWF World Cup, we held the Shoto-Kan Dojo Opening Reception in Shoto, Shibuya, Tokyo. For more details, please click here. The result for the 4th KWF World Cup. Male Kata (Winner/2nd place/3rd place) and Male Kumite from the quaterfinals movies. 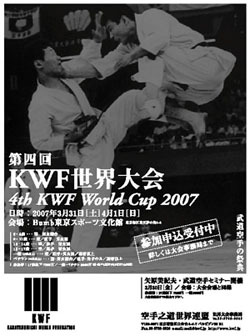 The 4th KWF World Cup and International Technical Seminar will be held in Japan. The result and highlights of the tournament.